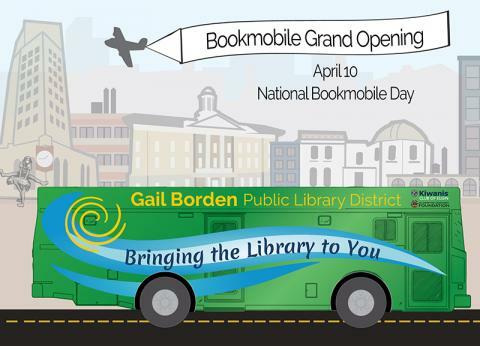 Everyone is invited to the ribbon cutting and to be one of the first to board the Gail Borden Public Library's new Bookmobile on National Bookmobile Day. There will be light refreshments, music, prizes and so much more! The bookmobile will begin services throughout the community soon thereafter. Thank you Elgin Kiwanis Club, Gail Borden Public Library Foundation, EFS Foundation and many more for supporting the Bookmobile and the Jack and Marlene Shales Bookmobile Collection. For more information about the Bookmobile, including how you can support it, please visit gailborden.info/bookmobile. The Gail Borden Library Bookmobile will be visiting visiting neighborhoods, apartment complexes, senior centers, recreation centers, parks and more. It will be making about 25 stops on a two-week rotation basis. The Bookmobile will have a variety of materials for checkout including books and movies for all ages. The vehicle can hold between 2,500 and 3,000 items. People will be able to return your items to the bookmobile or to any library branch—no matter where items were originally borrowed. Danny Rice is the new Manager of Bookmobile Services. He received his MLIS from the University of Illinois Urbana-Champaign and a Bachelor of Science from Illinois State University. He came to Gail Borden from Normal Public Library where he was the Children's Technology and Programming Librarian. Prior to his work in children's services, he was the Circulation and Outreach Services Supervisor at Bloomington Public Library where he oversaw the maintenance and activity of the bookmobile.